I am so excited to share this giveaway with you today. I have two pairs of B.A.I.T. shoes and they are definitely two of my favourite pairs in the closet. Today you have a chance to win a pair of B.A.I.T. shoes for yourself! The winner gets to choose a pair of shoes from B.A.I.T. Footwear! Visit B.A.I.T. Footwear and tell me which shoes you would choose! 1. Spread the word about the giveaway. If you are using Twitter make sure you mention @loveelycia & @BaitFootwear along with a link to this post in the tweet! 2. 'Like' B.A.I.T on Facebook. 3. Follow B.A.I.T on Twitter to stay up to date with what's going on in shoeland. 4. Visit the B.A.I.T. blog and say hello! The giveaway is open to anyone and I will announce the winner on Wednesday May 23rd! Good Luck! PS. The winner of the Lotta Losten giveaway is...Robyn D! Congratulations! I really want to spend all of my money at BAIT! I'd definitely pick the Terry in Red. Thanks for the giveaway! I love the Stacy's not sure which color I would choose but I am leaning more toward the pink ones at the moment! I love the Denise wedge in blue!! So many cute pairs of shoes. I love the Helena in red - gorgeous! I follow BAIT via twitter [@lo_ts]. Lonnie in yellow. Summer beachy fun! I like! :D Thanks for this great giveaway! I love BAIT! I usually say my favorites are the Eugina flats, but after seeing the adorable Trishas in action, I definitely pick them! Great giveaway! The Ida ones in seafoam - oh my gosh..pretty. Tara or maybe Ida....so cute! The Dennise in celery are BEAUTIFUL. The Emma in black is adorable! I have been dying for the black emma's since I've seen them. They are too cute!! I would lovelovelove a pair of Holly's in coral or Idas in every color! I loooove B.A.I.T. shoes! 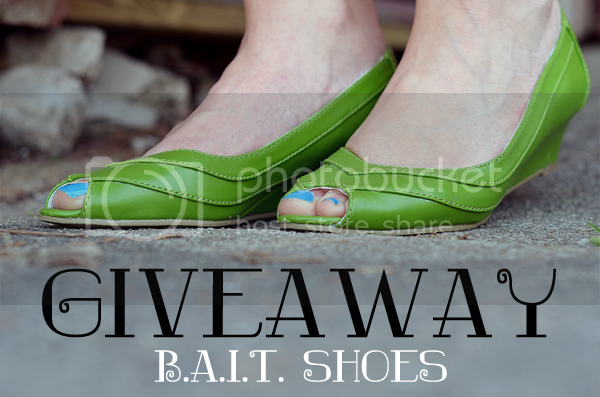 Great giveaway :) MY fav pairs are the Ida's in seafoam and the Dennise's in Celery! I also follow B.A.I.T. on Facebook. I would love the Terry ones in Red! Perfect to my polka dot 50s dress. I also follow B.A.I.T. on Twitter! I really lovelovelove B.A.I.T's Emma shoe in white!! So very pretty!! I also tweeted about the giveaway here! I enjoy Sable in black. super simple, and super cute. loving the Silla in turquoise! also the Sadonna in ALL THE COLORS! So hard to choose, but I love the Emma style in black. I love the Tara in red! Love the Terry shoes in red! Just 'Likeed' B.A.I.T on Facebook! I LOVE the Ida in seafoam. So cute. I'd choose the Ida in Seafoam, no Coral, no Seafoam. The Ida's in seafoam are adorable! Hi! I love the Ida shoes in seafoam! They are adorable. That is a tough choice, they are all so cute! I think I would choose either the Ida in seafoam or the Eugina in teal. I would choose the Joanna coral shoes! These shoes are so pretty! O would choose the Ellie in Teal. I also left a comment on their blog! I like B.A.I.T. on Facebook. I follow B.A.I.T. on Twitter. Oh my gosh, they have such awesome shoes! I think my favorites would have to be the Joanna heels in teal. I have had my eye on the Ida's in green forever now! I love Ida in seafoam! I said hey on their blog!! I tweeted about your giveaway as well!! I would love to have a pair of turquoise Ellies! I'd choose the Trisha in yellow! So bright and happy, perfect for summer. I would want the Holly shoes in white, I think! i'm torn between which pair i'd choose, definitely either the idas in seafoam or the sillas in white! I follow B.A.I.T. on Twitter! I stopped by the B.A.I.T. blog and left a sweet comment! I would pick the sadonna, sable or eugenia in black! Ida, Emma or Yorkie in any color! Oi I love their shoes. I can't spend too much time on their site or else I start drooling on my keyboard... Being a shoe addict only has a few downsides. I follow BAIT on twitter! I liked BAIT on facebook! I love the mika shoes. So lovely! I'd want either the Sadonna in gold or Emma in black. They're all so lovely! I love the IDA in seafoam, but the Holly in white is really cute too! and I'm following on Twitter @sarahsaarcasm! Oooh I'm such a fan of BAIT--I actually got their Emma in Black after seeing them on your blog. I think I love the Sadonna in Gold the best, because they will be so ridiculous and fun to match up with my crazy colored jeans. Thanks for doing this giveaway! Definitely the Silla flats...though the tough decision is whether to go with the red or the turquoise! They're both so lovely! Too many to choose! I love TARA in red stripe, EUGINA in teal, SADONNA in yellow and TIKI in both colors. Great giveaway! I like the Dennise in red! I love the IDA in Sea-foam! So cute!! Love the Terry in Celery! Still obsessed with the IDA in seafoam! i would definitely chose the ida. but the decision between seafoam and green would be really difficult! I like the Dennise in Celery! Silla in black are just my style. Love all their shoes! Love the Helena in Navy. They're so classic. The EMMAs are just killing me! I love the "Ellie" in teal! I love B.A.I.T. 's Dennise in red! The Trisha in fuchsia or the Helena in navy would suit me just fine!! Said Hi on B.A.I.T. 's blog. I'd get holly in coral!! I love IDA in coral!! I am in love with the JOANNA style in Black!!!! I also liked their facebook page! The Darla Turquoise are to die for!!!! I love the IDA Coral colored shoes! I like how the heels are just just tall enough to give a little height but not too tall that I'll fall over. Took a visit to the blog. i have the emmas in white, love them! right now i'm really loving the hollys in red, soooo cute! I was all, "meh, another shoe giveaway", until I clicked and toooootally fell in love with the ellie shoes in teal. Swoon! Oh my goodness, the Idas in seafoam are perfection! I think I'd have to go for the Darla in turquoise. So much fun! I love B.A.I.T. shoes. So many pretty pretty vegan options! My favorites are probably the Dennise or the Terry, although it's hard to choose. I hope they come out with a vegan pair of Emma, cuz I adore those! I definitely think I would choose the Darla Wedges in yellow!! fantastic! Dennise and Joanna! any color! stopped at blog and commented!! I love the Ida shoes in any color! I liked them on FB! I liked them on FB too! THEY ARE ALL SO AWEEEEEEEEEEEEEESOME! I also commented on their blog. i thought about the emma since that is my daughter's name but i just know they would make my feet look weird...plus i have been on a major multiple year spanning hunt for the perfect green shoes and i just found them...the ida in green! My favorite is Sable! Thank you! Thanks for having such an awesome giveaway, girlfriend! I also liked the facebook! I would get the IDA Spectator in Coral, they're gorgeous! Would go with the Ellie's in teal, or the Silla in turquoise! Silla in red! So cute! I love all their shoes, but the "Terry" in red is my favorite! Your comment will appear after approval. Thank you so much for stopping by and saying hi, I may not always respond but I always appreciate hearing from you. Wife, mom, former blogger. More info here.